Divine +5 weapons can be ascended to Occult +5 by Andre of Astora using White Titanite. The Divine Ember and Dark Ember are required to fully upgrade. Adds physical damage scaling to weapons from Strength and/or Dexterity stat per upgrade level, lower rate than Normal path. Most Occult weapons cost 200 souls per level to upgrade. The cost can vary however between 100 and 800 souls, depending on weapon size. The Occult aux. effect makes Occult weapons do extra damage against Silver Knights, Black Knights, Sentinels, Dark Sun Gwyndolin, Dragon Slayer Ornstein (but not Smough), and Gwyn, Lord of Cinder. Remember that removal of the Divine aux. effect means Occult weapons cannot prevent Skeletons from reviving. Occult upgrade path reduces the weapon's base Magic damage. Regardless of Faith level, this lowered base Magic damage is bad enough that the Occult path's Magic damage will never overcome its Divine counterpart, even with 99 Faith. Although, conversely, Divine path's physical damage will never overcome its Occult counterpart. 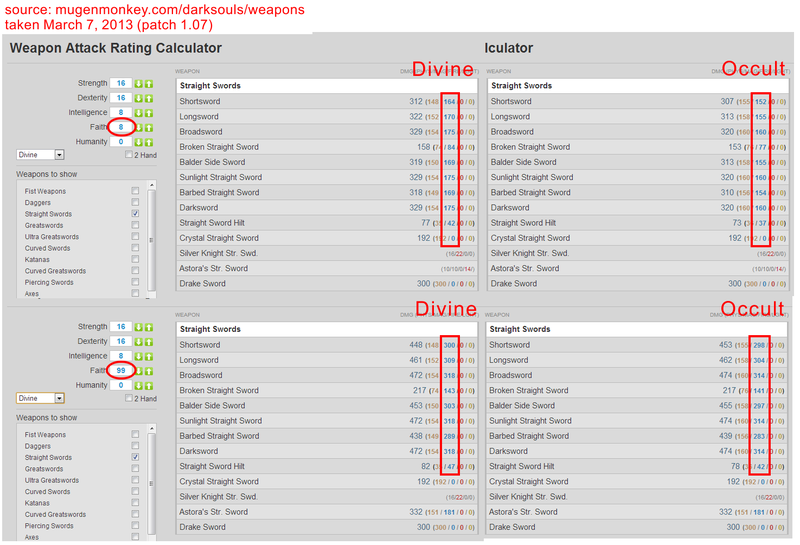 This means without factoring the auxilliary effect, at the same Occult/Divine level, the damage difference is almost negligible; some enemies may take slightly higher damage with Occult, and other enemies may take slightly higher damage with Divine. For Occult Weapon Trophy/Achievement, use this weapon rather than starting from scratch as only 7 White Titanite Chunks and 1 White Titanite Slab are needed to fully upgrade it.